A long, long time ago—approximately 13,000 years back, that is—a great mass of ice entombing much of British Columbia and the surrounding region began to crack and crumble. Temperatures climbed and life sprouted in the wake of the melting ice sheet. Gradually, botanical colonizers crept northward and took root along the southern coastal fringes of British Columbia. When Garry oak trees (Quercus garryana) finally arrived on the scene 8,300 years ago or so, the deeply grooved and twisted sentinels settled in among mossy knolls, fields of blue camas, other delicate confetti-like flowers, slender grasses, and a host of additional species—all adding up in various combinations to what we know as Garry oak ecosystems. Roughly 7,500 years ago marked their glory days. Soon (in geological terms), rainfall increased and the temperatures began to slip; 3,800 years ago, Garry oak ecosystems shrank into patches dotting the larger Douglas fir–dominated landscape. Their remnants are primarily found along the southeast coast of Vancouver Island and on the Gulf Islands, where mild conditions and gentle topography remain kind to the local icons. For thousands of years, Indigenous peoples across the Garry oak landscape, such as the Coast Salish of British Columbia and Washington, took on the role that lightning naturally played. 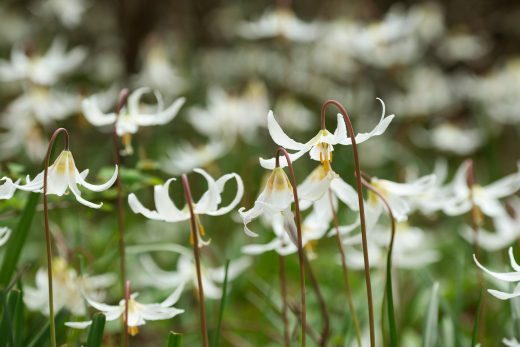 The flames they fanned kept woody interlopers—shrubs and trees—away from meadows where women tended camas and other bulbs. The intentional fires also helped improve berry yields and keep space open for hunting. When Europeans stumbled ashore in today’s Victoria and fawned over the park-like landscape, they likely didn’t recognize how significantly it had already been shaped by humans—or how drastically they were about to disrupt it. Not long after the newcomers started staking claims, hammering down homes, and tending livestock in the mid-1800s, they extinguished the fires, implementing restrictions that disrupted the long-standing management regime and allowed shrubs and trees to take over meadows. Since then, steady development and a conga line of invasive species including Scotch broom, English ivy, Himalayan blackberry, sweet vernalgrass, and, more recently, bur chervil have consumed many of the remaining patches. Today we find our heroes reduced to a shadow of their former glory. While oak trees on their own are still common, they are often marooned in pavement or turf, away from the mosaic of life they once presided over. 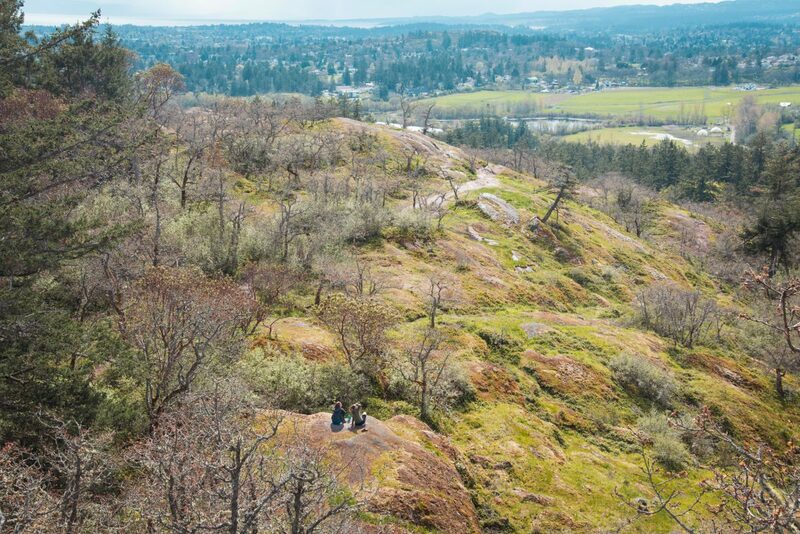 Only a tiny fraction of the remaining Garry oak ecosystems in British Columbia are in near-natural condition—many of which cling to less-fertile habitat on rocky outcrops and bluffs. In the US range, from Washington to California, Garry oak ecosystems—aka Oregon white oak ecosystems—have fared roughly the same. Nineteenth-century farmers from Europe cleared this habitat for agriculture first, before moving on to the more forbidding forest, says anthropologist Douglas Deur from Portland State University. Only small fragments have survived urbanization and agricultural conversion, he adds. 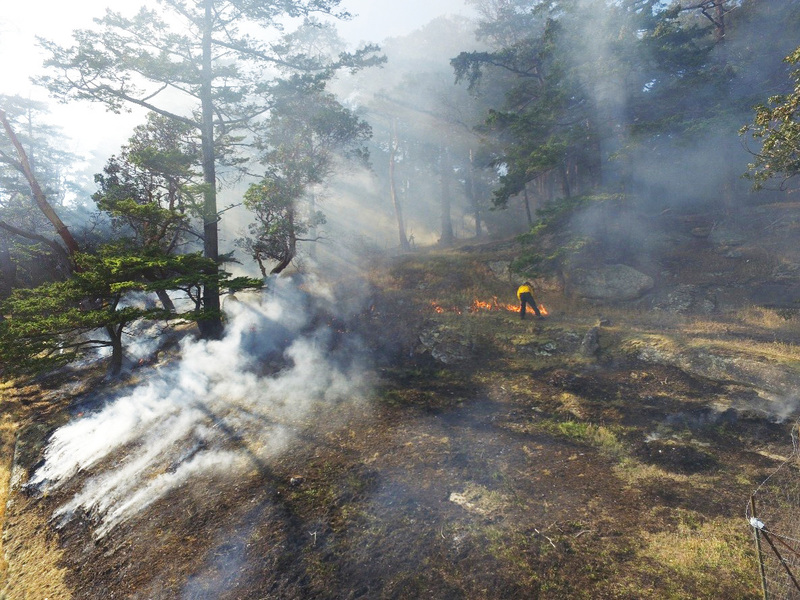 Today, many of the remaining Garry oak sites throughout their range persist largely with the intervention of volunteers who yank out invasive species, fire-savvy ecologists, and knowledgeable Indigenous leaders. 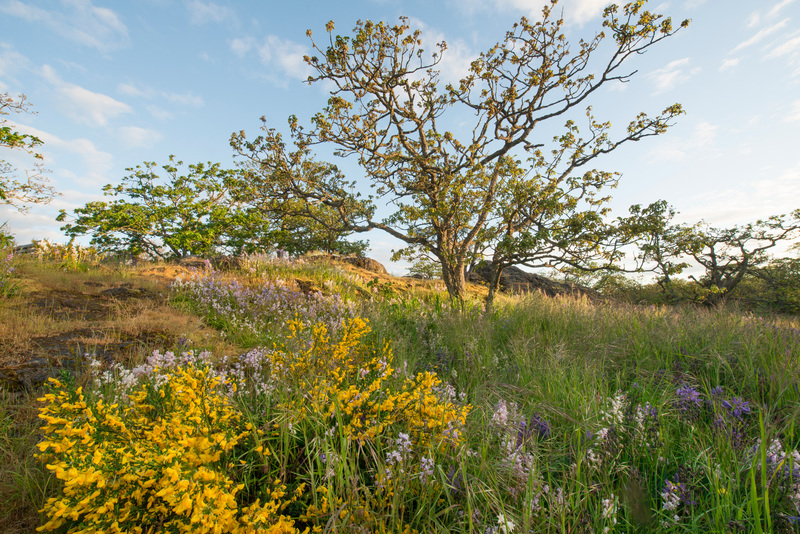 Those fighting on the ground for Garry oak ecosystems over the past few decades have had successes, though a Happily Ever After is far from a guarantee. After all, the saga of Garry oak ecosystems is more a short story in geological time than it is a tidy fairy tale. And like many good short stories, this one has an equivocal twist. The ecosystems favor the warmer, drier conditions that climate change is projected to deliver to their range. 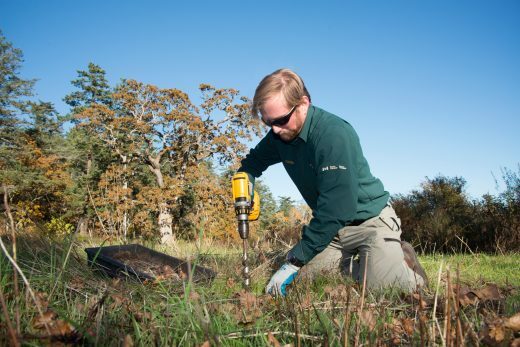 If Douglas firs become too thirsty and decline in British Columbia—a possibility scientists are still drilling into—Garry oak ecosystems have the potential to spread into that space (unless invasive species beat them to it). Parks Canada ecosystem scientist Marlow Pellatt agrees Garry oak ecosystems could swell with a little elbow room, and climate models he worked on show that conditions for Garry oak habitat will improve to the east in parts of the US range. However, in British Columbia, the ecosystems are not destined to storm north across the landscape, pushing far beyond their current limits, as others have suggested. They may expand a little to the east on the mainland, he says—“whether oak can get there or compete is another question”—though along the coast north of Vancouver Island, climate and topography will continue to conspire against them. To have Garry oak ecosystems persist in any capacity, we need to save every bit that’s left, says Hebda, and protect areas where they might shift in the future. 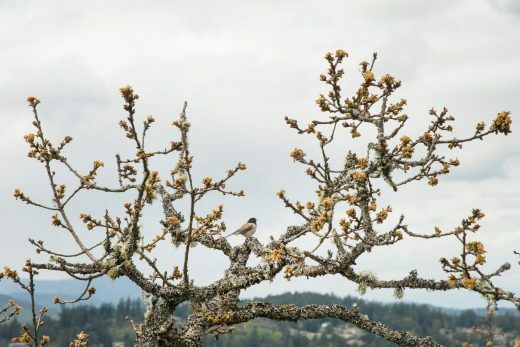 In this photo essay, we look at Garry oak ecosystems around southern Vancouver Island, beautiful if beleaguered, at this transitional moment in their story. The Garry oak, which arrived some 8,300 years ago, is British Columbia’s only native oak. Some Garry oaks are likely more than 400 years old. The largest are found in Oregon, where one behemoth measured more than 36 meters tall and had a crown that spanned some 38 meters. 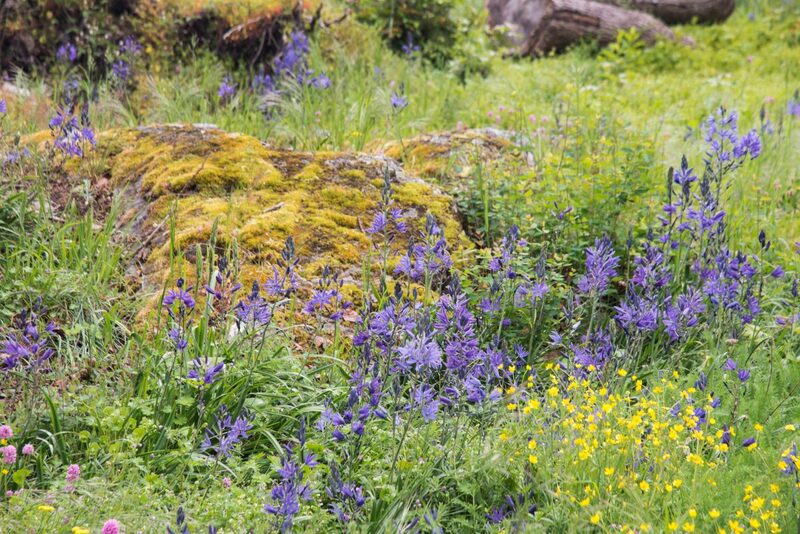 At many sites, a Garry oak meadow exists temporarily—if left alone, it will slowly be taken over by Douglas fir and other species. Here, shootingstars erupt in a Garry oak meadow fringed by conifers. 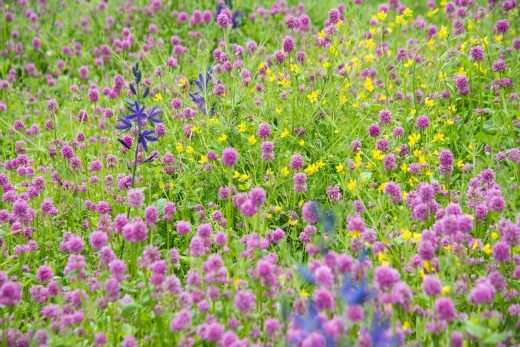 While we continue to debate whether a tree makes noise if it falls in the forest and no one’s around to hear it, here’s another brain-twister: can a meadow without a Garry oak tree still be considered a Garry oak meadow ecosystem? Yes, says Hebda. Garry oaks reproduce readily, but few seedlings make it to maturity—deer like to munch on them. 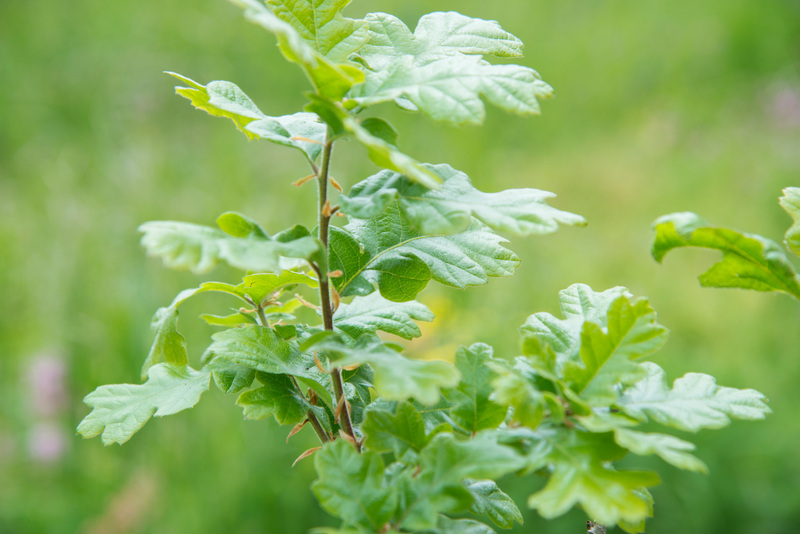 Garry oak leaves contain about the same amount of protein as alfalfa. Rocky outcrops are prized sun-worshipping spots for garter snakes, and the gnarled branches of oaks make ideal roosting spots for birds. 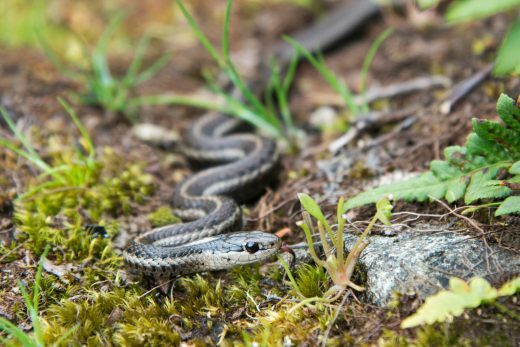 Seven reptile, seven amphibian, 104 bird, 33 mammal, and a whole slew of insect species have been tallied in Garry oak ecosystems. Yet, as environmental conservation specialist Marilyn Fuchs points out in a 2001 paper, almost all of the vertebrate species that relied exclusively on Garry oak ecosystems, such as subspecies of horned lark and vesper sparrow, are extirpated or in serious trouble. 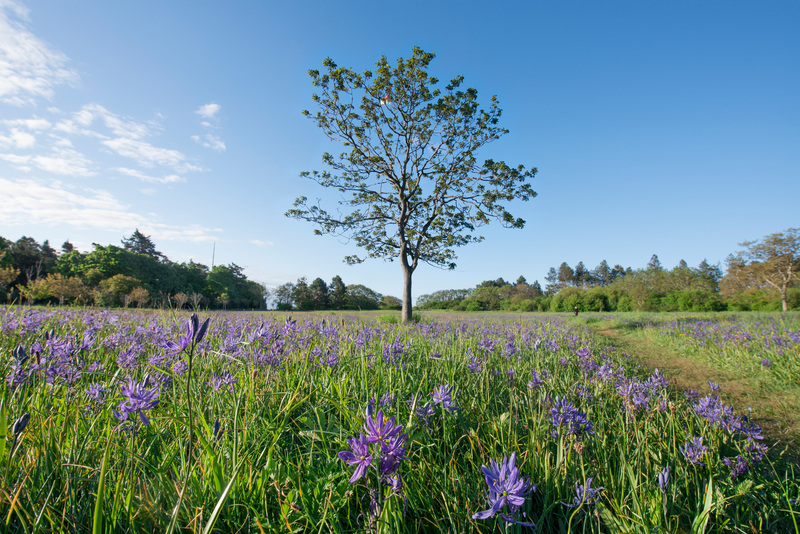 Roughly 700 different plants grow in British Columbia’s Garry oak ecosystems, surpassing the plant diversity in every other terrestrial ecosystem in the region. 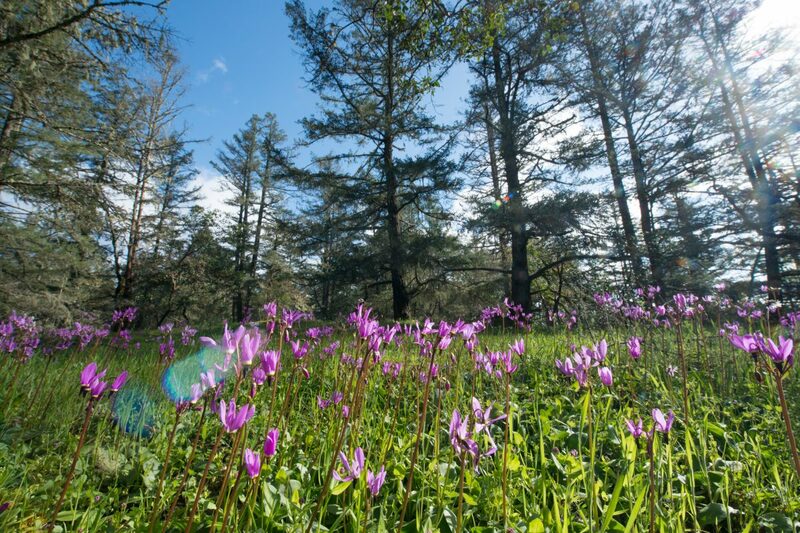 In the spring, Garry oak meadows burst, briefly, with wildflowers: great camas, sea blush, and western buttercups on the left; white fawn lilies on the right. 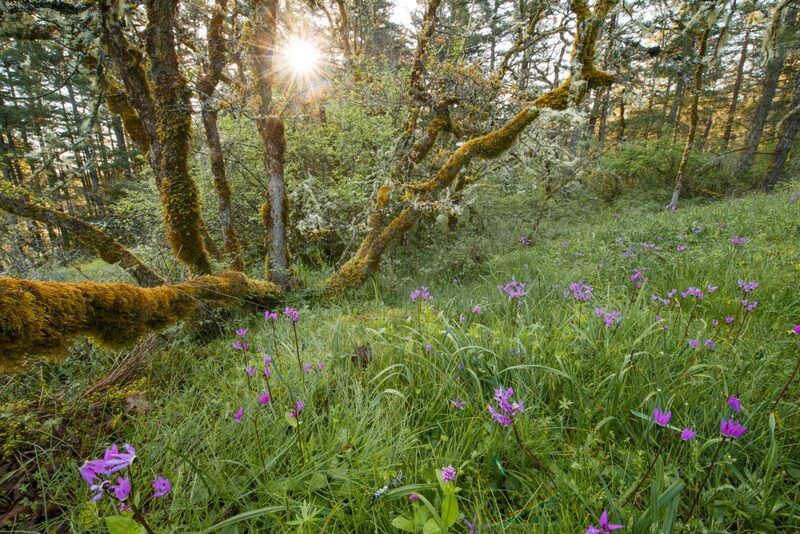 Greater Victoria sits at the epicenter of Garry oak ecosystems in Canada. European settlers were fond of the open, rolling landscape they found here, but buildings and roads quickly supplanted much of the vegetation. Many of the remaining Garry oak ecosystems are found on sites with marginal habitat that escaped construction. 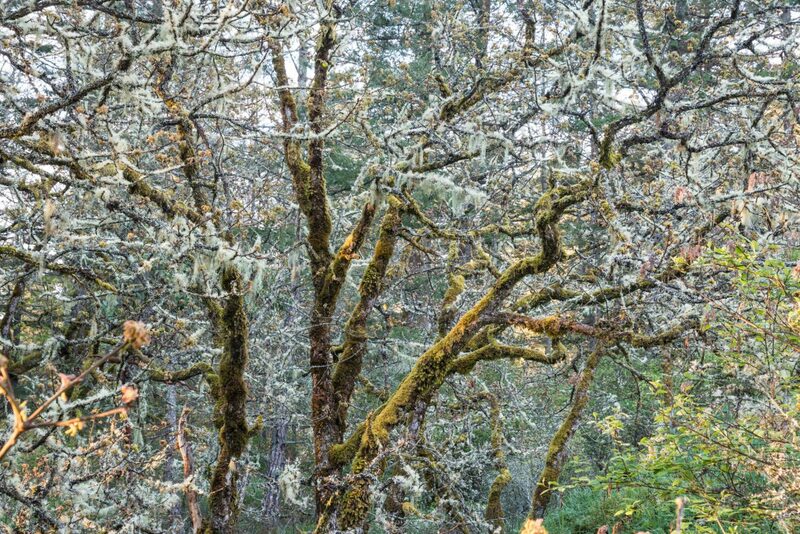 In the 1990s, botanists, ecologists, and other experts began rallying around Garry oak ecosystems, leading to a groundswell of awareness and support that has helped preserve sites and stave off some additional loss. While only some nonnative species found in Garry oak sites are considered invasive, they manage to do significant damage if left unchecked. Scotch broom (left), a shrub from Europe and the Middle East, spreads quickly, alters soil chemistry, and shades out smaller plants. Its seeds can survive in the soil for at least five years, but possibly as many as 30. 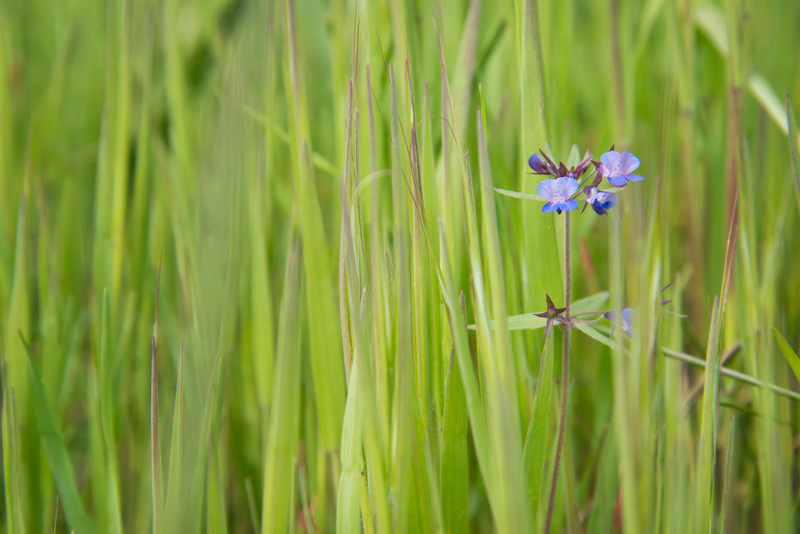 The common velvet grass seen here crowding a native blue-eyed Mary is just one of the problematic species flourishing in Garry oak ecosystems. Nonnative grasses account for as much as 80 percent of vegetation at woodland sites. 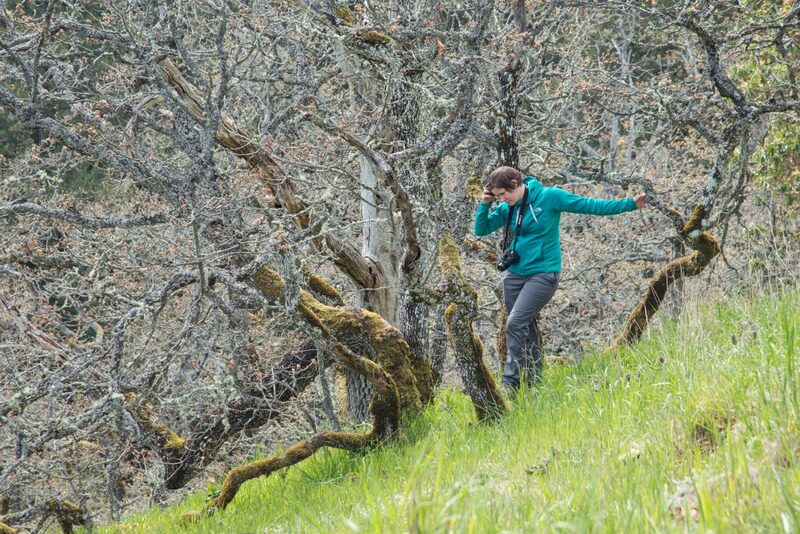 Ecologist Nancy Shackelford recently studied the resilience of Garry oak ecosystems, including whether weed control is a benefit overall to the ecosystem, or if it simply creates space for invasive species to outcompete native species. “It was a concern that this management was a waste of time,” she says, “but it does seem to maintain the identity of the meadow, preventing woody change, and in doing so keeps the same amount of sunlight and space availability for a diversity of species.” The sites she surveyed have generally stayed consistent in size and species richness since they were last analyzed 10 years ago, because of management efforts. Garry oak trees bear a resemblance to English oak and some people once believed, inaccurately, that Sir Francis Drake sprinkled acorns from his homeland when he visited in the late 1500s. To the dismay of settlers, the trees proved inferior for shipbuilding compared to the trees of their homeland. Camas is the celebrity of Garry oak ecosystems. 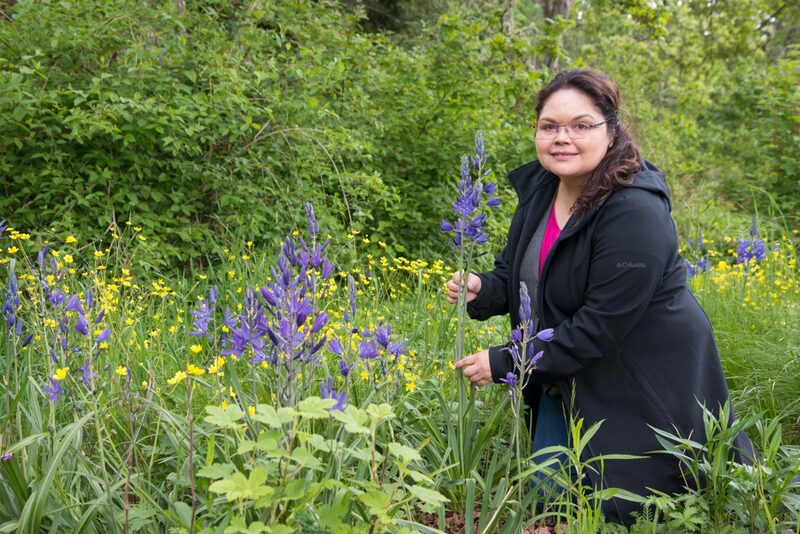 Indigenous women once tended vast meadows of camas—both common and great camas—and harvested the carbohydrate-rich bulbs. Other species found in a Garry oak ecosystem, including oaks, were also valuable. Elders interviewed by Hebda and ethnobotanist Nancy Turner for the book Saanich Ethnobotany say that tea brewed from Garry oak bark, for example, could treat hemorrhaging and tuberculosis. Cheryl Bryce, an ethnobotanist and leader in the Lekwungen Nation, part of the Coast Salish community, explains that only certain women managed camas meadows and were selective about who they invited to assist them. 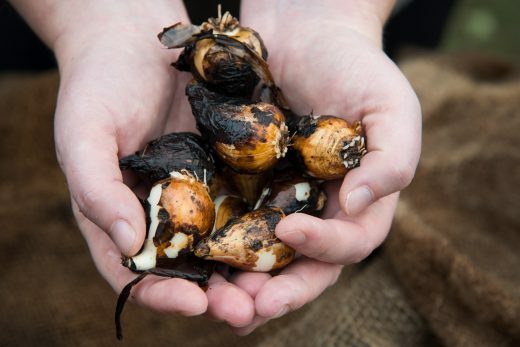 As harvesters worked, they turned the soil, replanted some bulbs, and dropped seeds, which, along with intentional burning, helped keep the camas bed healthy. 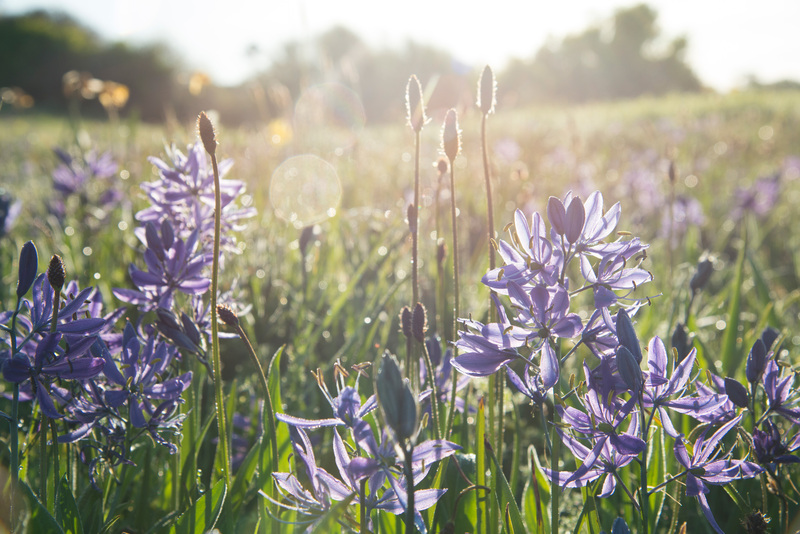 In Lekwungen, the word for camas and Garry oak ecosystems is kwetlal. Lekwungen people continue to harvest camas bulbs, on a smaller scale, and slow roast them in a pit. When cooked, the flesh looks like an onion’s, but has the texture of a potato and sticks to the teeth. 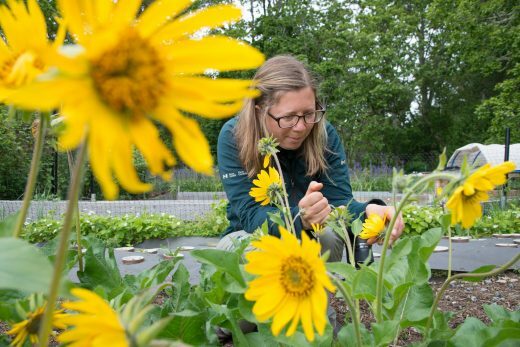 One of the big successes for staff at Fort Rodd Hill National Historic Site has been increasing a population of endangered deltoid balsamroot from three plants to about 180. Aimée Pelletier (left) says it was once so plentiful in the region that people ate the tubers—now there are only nine populations left, all on Vancouver Island. They’ve also nurtured golden paintbrush, which is down to two populations in the wild in Canada, as well as several more of the 62 species from Garry oak and related ecosystems currently listed under Canada’s Species at Risk Act. 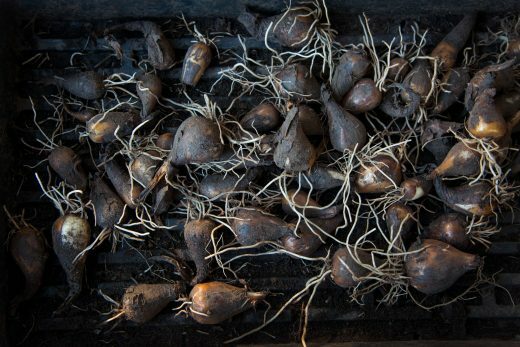 Each fall, Nathan Fisk (right) and others select camas bulbs from the nursery to transplant into the meadow, where they lie dormant over the winter—sometimes using a drill to speed up the planting process. 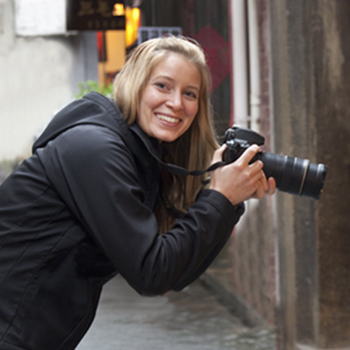 Cite this Article: Shanna Baker “Coastal Oakscapes,” Hakai Magazine, Apr 24, 2018, accessed April 26th, 2019, https://www.hakaimagazine.com/videos-visuals/coastal-oakscapes/.